Novelist Keltner (Buddha Baby, 2005, etc.) examines her struggle to define her own identity as a Chinese-American. 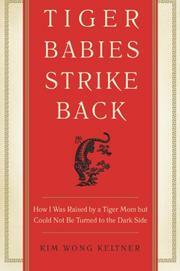 Shaping her memoir as a rebuttal to Yale law professor Amy Chua's controversial and best-selling Battle Hymn of the Tiger Mother (2011), Keltner writes about her experiences being raised by a vintage Tiger Mother and her rejection of that model. Only as she reached adulthood did she realize the extent of the prejudice faced by Chinese immigrants and begin to appreciate her family. The author describes how her own mother referred to her as lazy despite the fact that by age 38, she had graduated from the University of California with a double major and published three novels while putting her husband through graduate school and then raising a daughter. Her parents immigrated to America after World War II, and they were intent on working hard to make a success of their new lives, while still holding on to Chinese traditions. Keltner wanted nothing more than to identify with her American schoolmates. In college, she studied English literature and met her husband in a Chaucer class. Even though he was white and only a schoolteacher, Keltner’s parents accepted him into the family and adored their granddaughter. Eventually, she and her husband moved from San Francisco to the less-stressful environment of Nevada City, away from the web of family obligations. The author writes with compassion, humor, love and anger about her mother's combination of tough love and high expectations. “[N]ot every Chinese parent rules the home with an iron fist of fury,” she writes. Anything but a Tiger Mother herself, she lavishes love and attention on her daughter. A quirky reflection on the modern immigrant experience and hyphenated ethnicity in America.